The official date of fall is slowing creeping closer, it's next Friday, and I'm ready to be one season closer to winter. It actually feels a bit like fall already, which I'm obviously happy about. We had warm weather last year well into October, I even remember Halloween being quite mild comparative to other years (though it still rained, it always rains in Chicago on Halloween, sort of like it does in Kentucky on Derby day), so I'm happy we're already getting some cooler temperatures. We're slowing transitioning our home over since John let me put up a few Halloween decorations inside, but he said I have to wait until October 1 to put them up outside (fun hater), and I'm already stocking up on all of my other fall must haves too. 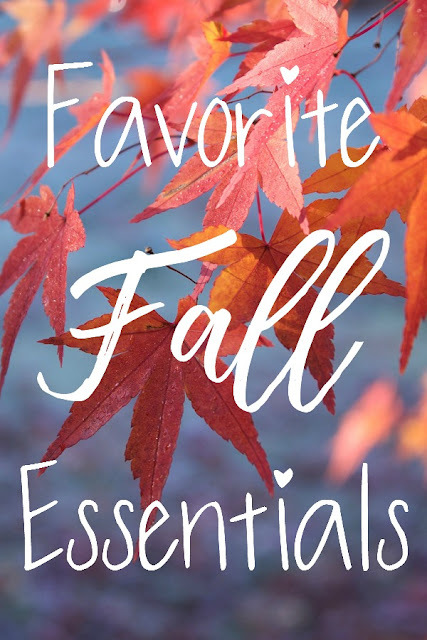 Besides the Halloween decor, I figured this was a good time to share some of my other favorite fall essentials. Riding Boots. I got mine years ago off JustFab for super cheap and it's amazing how often I wear them in the fall and winter. They are on their last leg so I'll have to replace them this season, though I'm trying to hold out so I don't have to buy them at peak price. Dark Lipstick. I'm not a dark lipstick person in the winter, it's strictly a fall thing for me. But in the few months where I feel like I want to wear it, I really embrace it. My favorite lipstick is the Bite Beauty Amuse Bouche line, and Liquorice and Black Truffle are two dark colors that I love. Dark Nail Polish. I'm just like a happy little vampire in the fall or something, give me all the dark things. Dark nail polish is a must for me too, and I like almost black colors and deep berries. Or actual black, that works too. I use the CND Vinylux line, which they have at Ulta. I have Bloodline, Dark Dahlia, and Black Pool. Warm Fragrance. My favorite fragrance for spring and summer is very sweet and fruity smelling, which just doesn't work as well in the winter (it's Pacifica Brazilian Mango Grapefruit, by the way.) So for the fall and winter I switch to a much warmer scent, the Elizabeth and James Nirvana line. Even at this age, I'm still a sucker for those Olsen twins. I think Black, Bourbon, and Amethyst all smell like fall to me, with Bourbon being my favorite. I just have the rollerball at the moment but the full bottle is likely going on my birthday wish list, I love it that much. Smells too smoky in the bottle but it doesn't when you wear it, try it on at Sephora and let it settle on your skin for a few minutes. And ignore the Sephora reviews that don't like this one, I don't agree with any of them. Creamy Moisturizers. Lotions are okay for me for spring and summer, but my skin is more dry in the fall and winter, which requires a creamier, thicker moisturizer. John and I both love the body butters for this. For my face, I prefer First Aid Beauty. Long Sleeve Tops and Sweaters. Almost all of mine are from Venus. Actually, I think all of them are. Their clothes just work well for me for some reason, so a lot of my shirts for all seasons come from there, but I'm picturing the inside of my closet right now and can't think of any long sleeved shirts that aren't from there. Deep Conditioning Hair Care. Winter dries out hair and if you get static craziness when you wear a hat (I hate hats, I don't wear them at all, ever), then you need deep conditioning hair care as well. I use a mask/deep conditioner in the shower, my favorite being the It's a 10 for Blondes and the Shea Moisture Masque. When it's dry, I smooth it with a couple drops of oil or a frizz taming spray. Football App. What can I say? I care deeply about my fantasy team and must keep up to date on stats and injuries and trades at all times!